Our Passover Seder last month was, for the most part, an unparalleled success. We fled Egypt from the dining room table and ate a lovely dinner that everyone seemed pretty happy about, although Mom’s “get up and go” got up and went shortly after the meal started. We helped her to the car. Sweetheart drove her back to the nursing home while the rest of us chanted the blessing after meals (okay, so not all of us chanted, but some of us did), opened the door for Elijah and read Psalms of Praise. The part that wasn’t so successful, for me, was a meat thermometer failure. The roast ended up medium rare, way more done than I like. I’m a rare kind of person. And I love a rare kind of person. The kind of person who, a month after making an offhand remark about taking his beloved out for a fancy steak dinner, makes a reservation at a really fancy steak house. “So you can get the rare meat you missed at Seder,” he said, as we raked up brush in the yard between watching the bees fly in and out of the hive on Saturday. Up until then, it had still been cold or rainy and not terribly nice. Bees don’t like going out in that kind of crummy weather any more than people do. So I’d been worried about my fuzzy amber-colored pollinators. 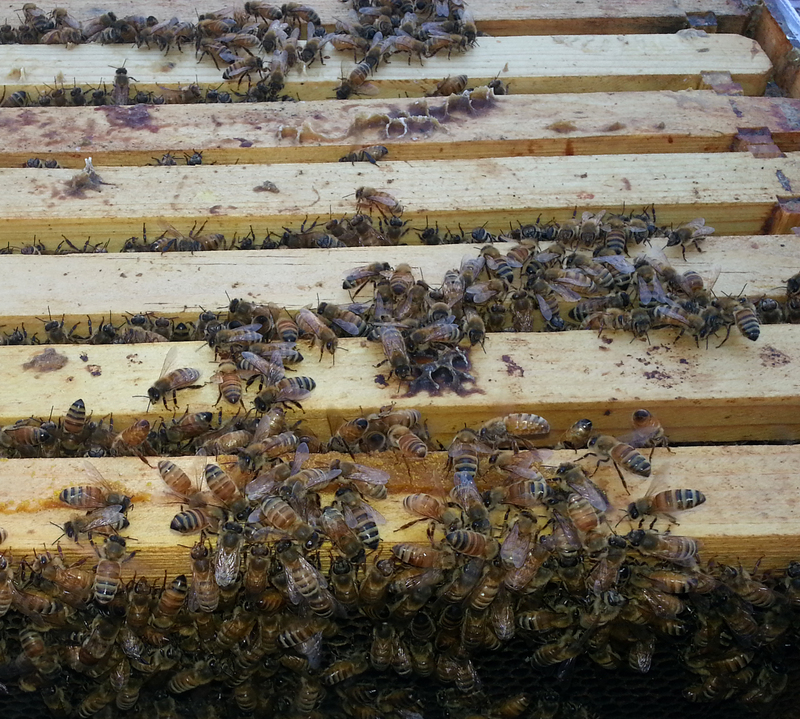 This past week though, when we opened the hive for the second time since installing our two-pound package of Carniolan bees, we discovered some great news. In a new hive, brood is the best thing you can find. It means the bees have accepted their queen and she is laying eggs. Brood means baby bees, baby bees mean more bees, and if they’re making more bees, they have enough to eat. 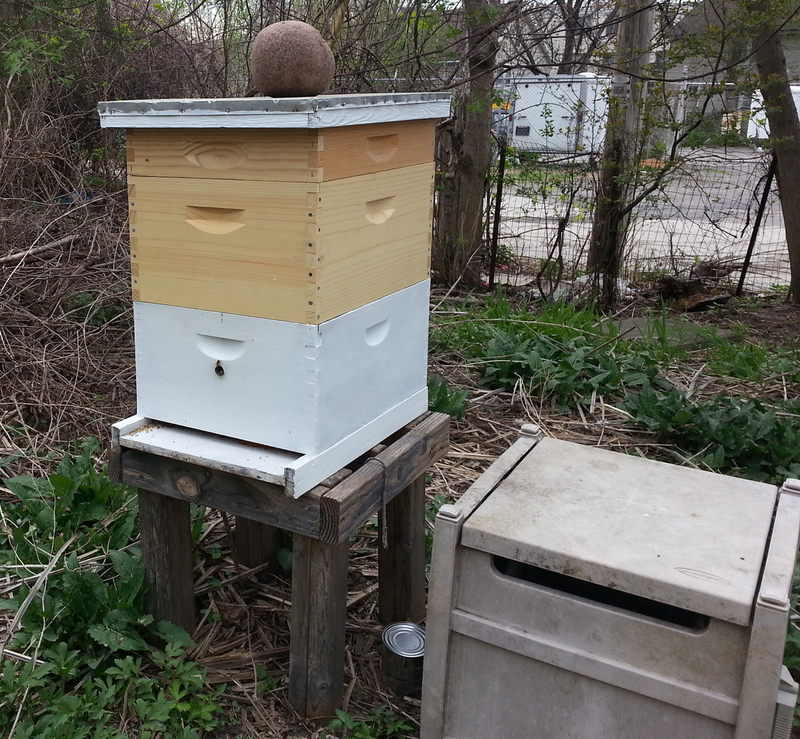 So, Hurray for our queen, Latifah of the Backyard Hive! Also, I got stung for the first time. A bee flew into the back of my pants and probably freaked out. I pulled the stinger out and iced it. It didn’t hurt too badly. Alla, whose father and grandfather kept bees, says you’re a real beekeeper when you don’t notice the stings. I’m not there yet. I suppose I should get a suit at some point, but right now my only protective gear is a bee veil. Sweetheart doesn’t even have that. He coaches me from the sidelines between blowing puffs of smoke at the bees to keep them from getting any funny ideas about attacking while I’m lifting frames and looking to see if things are okay. In other exciting beehive news, a raccoon tried to open the hive sometime this week. We’re pretty sure it was a raccoon because the rock on top of the hive was on the ground next to it. The top was jostled but not pulled off, which would make sense if whatever was trying to pull it off could only do it while sitting on it. The raccoon rolled the rock off the left side of the top, then sat there trying to get the top off. I don’t know if raccoons understand about gravity. Or physics. The raccoon was probably after the sugar syrup we’re feeding the bees until we know there’s enough in bloom for them to get food on their own. I’m not sure I’ll know before the bees do. What I am sure of is that that won’t stop me from trying to figure it out. We were en route to the restaurant when I realized I was scanning every patch of open space for dandelions and other blooming things. And it had nothing to do with pretty flowers. It was because I’m a Jewish mother with a beehive. I feel like I am really having conversation with you even though I rarely get to talk to you. Thank you.